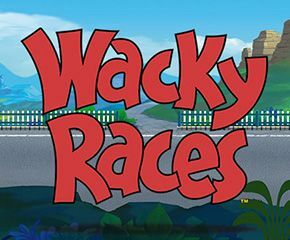 Wacky Races is the name of a much-beloved TV series with an iconic cast of characters. It also happens to be an online slot that features 5 reels and 40 paylines. This slot heavily borrows from the TV series of the same name and can be played on different platforms. It’s also crammed to the breaking point with bonus features and is overall easy on the eyes and quite addictive. The featured graphics are cartoonish, colourful and representative of the TV show of the same name. The provided icons include A, K, and Q, as well as the cars game characters races with. There is a Dastardly and Muttley icon present, which is by far the most valuable, as it makes possible a 10x multiplier of the stake, for 5 when the player is on an active payline. It is also wild for all the featured symbols, save for the pair of Wacky Races Wild and Wacky Races symbols. There’s also something called a Better Bonus mode that players need to look out for. Should this mode be activated the bonus features get a considerable boost? • Mystery Stacked Reels – this gives each reel a stacked mystery symbol. These icons will also get randomly replaced with other icons at the start of each spin. • Random Wild Feature – this is triggered totally by chance during the base game. • Wild Reels– this is activated at random in the base game. It makes all icons on one and more reels wild. • Racing Bonus Feature – this comes into being when three Wacky Races wild symbols and Wacky Races icon make an appearance on reels 1, 3 and 5. Prizes awarded for this include an initial 10x free spins. More free spins can also be triggered in this round, for a maximum of 200 free spins. • Penelope Pitstop Free Games – This feature makes possible a dozen free spins and opens the possibility of locking reels that stay wild until the round is ended. 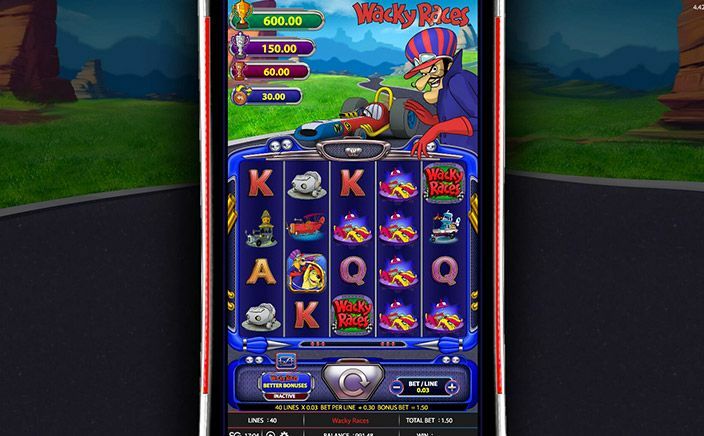 • Muttley Wacky Scrap Yard Bonus – This boasts an astounding 1000x multiplier of the line bet that is triggered when this bonus feature is skilfully played. • Professor Pat Pending Wheel Bonus Feature – makes a 400x win off the line stake possible. • Peter Perfect Trophy Bonus Feature – For correctly making the picks, the player stands to make up to 500x of the line stake during this bonus feature. This slot is immensely playable and packs in more bonuses than the majority of its contemporaries. Overall, it’s a heavy-hitting bundle of fun that will no doubt prove to be awesomely addictive.